It felt good to be sewing clothes for the girls again. I tried out the Field Trip tee-pattern from O+S and while I'm not satisfied with the stitching (I'm not an experienced knits sewist) I loved the pattern and how easy it came together. 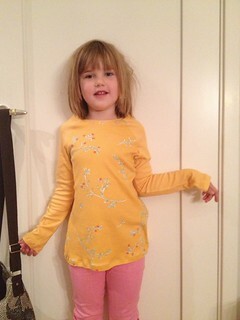 Sofia loves the tee and has worn it on multiple occasions - pulling it off the line as soon as it is dry. The next I make for her I'll shorten the neck band and see if I can make the neck less wide and get the shoulders to sit properly. The knit is a Moda interlock, in the City Weekend collection by Liesl Gibson. I love it and I want a shirt from it for myself. My friend - the fabulous Mel - managed to track down some of the pink colourway and it is on its was across the Atlantic as we speak/read. I kind of want to keep it for myself - but the candy pink really isn't my colour.